In my car--I am the driver--watch me now! Her fists were clenched, knuckles white. She was beginning to feel the tightening in her chest and it was getting harder to breath. Her stomach was churning and she was starting to sweat. She moved to the middle of the backseat and fastened her seatbelt. She put on her sunglasses and got out her knitting to have something to concentrate on other than the trip. She was a passenger of a crazy driver. So it’s probably established that I don’t always like other people’s driving and what really makes me nervous is being the passenger. Sometimes I don’t have a choice. I have to ride with people who think they are great drivers. I don’t always agree. Here’s what I could offer if asked. When you are driving on the Interstate it’s not a good idea to turn completely around to talk to the person in the back seat. When your car starts the bumpity bumpity bumpity sound, it should be a signal that you are not in your lane. When horns honk and people fly by with their fingers in the air it could mean that you almost hit them or just pulled out in front of them. It’s not the best plan to stop in the middle of the road instead of pulling to the side to look at the map. It’s probably not the safest thing to reach in your purse, which is in the back seat, to answer your cell phone or look at a text. Making a U-turn is legal in a lot of places. Before you do, make sure you have the space and don’t have to back up into oncoming traffic to get back on the road. If all the cars are coming towards you, it’s possible you are on the wrong side of the highway. Look in your rearview mirror before you back up so you don’t ram the car behind you. In the meantime, you can have the front. When I have to be the passenger, I’ll try to be in the backseat, in the middle if possible, hoping for side air bags, doing a full body tense and pressing an imaginary brake repeatedly. My knuckles will be white and my jaw clenched in fear. 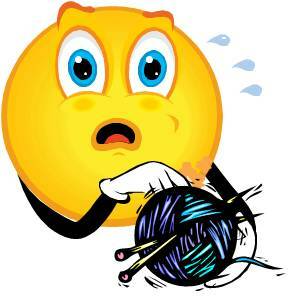 I’ll have my knitting or a cell phone or anything to concentrate on so I won’t know if the accident happens. I have a great idea though. Just give me the keys and let me drive! Finished turquoise cowl, with pin. Blocked, shown with no loops. Turquoise Cowl, doubled with pin. Knitayear is winding down. I’ll be finished in another month or so. But for now I’m still going. Day 321 is February 15 and another trip to Austin. The travel for work seems to come in spurts. I might not have to go anywhere for the next couple of weeks. But February has sure been busy. I’m going for something new at work and I’m glad to be included. I choose orange variegated flag yarn. Day 322, February 16, and I’m feeling a little more rested. I was so tired when we got in last night I didn’t even go shopping. That’s tired! I’ll make up for it tonight. We start out early and meet the rest of the group at the session. It’s interesting but I have a lot of catching up to do. I’ve heard the terms but haven’t been directly involved. I’ve got to sort out a bunch of acronyms and ratings and such. I’m a little behind but I will catch up. I choose a rich purple wool. Day 323, February 17, and the meetings are dragging. It’s my first but the others say it’s a repeat of a previous one. On the upside we are able to plan a lot for our ESC. Another plus, we are able to get on an earlier flight. Hooray! I’m feeling lucky about that and just about being where I am. I choose a pretty green with some colored flecks for today. February 18, day 324 is my Friday off. I love when that happens! I sleep in for as long as I want (or can). One of my coworkers is in town so I meet her for lunch. It’s a good thing or I may not have gotten dressed today. It’s a relaxed day. I choose a variegated purple, blue and green. Peaceful colors. Lunch is nice and even nicer is I get to drive back home. In my car. Saturday, February 19, is day 325. I worked on the yarn. I’ve got even more than I realized. It’s going to take me a while to sort everything. And then I’ll think I found all the blue and here’s another tub. I worked on that most of the day. Probably not up to standard but I’m doing it. I picked a bulky pinkish color yarn. I went outside today but I didn’t drive anywhere. It’s easy when you go places by yourself though. You always get to be the driver! New brown boucle cowl. Plane knitting. Wow, some pretty crazy driving stories there, I can understand how you'd be nervous! love the cowl and the pin, they match perfectly. As I get older, I get pickier as to who's driving the car I sit in, I find. I have found that your writing always brings a smile to my face and a chuckle from deep inside no matter the topic. Your gorgeous cowl was the icing on the cake! @Sinéad...Believe it or not every one of those things happened. And it was all the same driver! @Experimental Knitter...I doubt I'll ever be the Daisy in driving Miss Daisy!